Why would I need self storage in Joliet, IL? There are a variety of reasons why you might need self-storage in Joliet, IL. How much is a storage unit in Joliet, IL? The cheapest storage unit in Joliet, IL is $49.00 per month. What size storage units do you have available in Joliet, IL? In Joliet, IL we have sizes that range from 5'x5' to 10'x30' to suit your storage needs. How much is it for a 5'x5' storage unit in Joliet, IL? The cheapest 5'x5' storage unit in Joliet, IL is $52.00 per month. 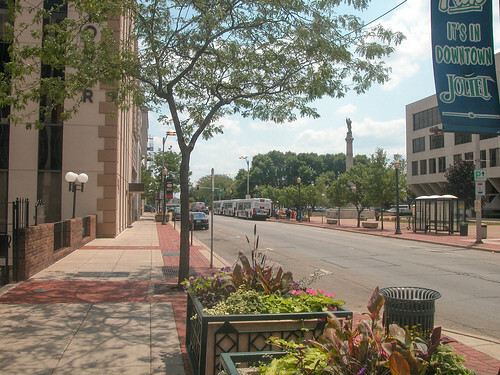 Joliet is a bustling city just 30 miles from Chicago. It's home to a steadily-growing population, earning a spot among the largest cities in the state of Illinois. The city is home to a number of interesting landmarks, like the nation's first Dairy Queen, NASCAR's Chicagoland Speedway and the Rialto Square Theatre, a favorite hangout spot of crime boss Al Capone. The first recorded history of the area that's now Joliet began in 1673, when Louis Jolliet and Father Jacques Marquette camped on a mound that later became the city. In 1834, the village was laid out, planned by James B. Campbell. He named the community Juliet after his daughter, and the town was briefly incorporated. However, residents soon voted to reverse the incorporation in order to save money on local taxes. In 1845 the community was renamed Joliet and was reincorporated in 1852. The Rock Island Railroad arrived in the town that same year, drawing new development and residents. Throughout the years, many manufacturing industries have been attracted to the area, including steel mills, brick companies, horseshoe factories and clothing companies. Because the Joliet economy has historically depended on the manufacturing industry, it's had to overcome several challenges over the years with the ebb and flow of the national economy. Although its unemployment rates are slightly higher than the state's average, Joliet is in the process of evolving from a manufacturing economy to a commuter-based suburb, with many locals traveling to Chicago for work. If you'd prefer to stay within Joliet city limits for work, there are a variety of options to consider. The largest employers in the city span several different industries, ranging from education and health care to entertainment and retail. You may want to start your job search at one of these companies and organizations, which include Presence St. Joseph Medical Center, the County of Will, the local school district, IKEA and Harrah's Joliet. Joliet's elementary and middle schools are part of the Joliet Public Schools District 86, while high schools fall under the jurisdiction of Joliet Township High School District 204. The University of St. Francis offers a variety of post-secondary degree options, as does Joliet Junior College, the country's first public community college. Utilities: The city's public utilities department provides water and sewer services. Local energy suppliers include Commonwealth Edison and Spark Energy. Garbage and Recycling: Trash and recycling are collected curbside on a once-weekly basis. Transportation: Two different Metra routes serve the city of Joliet, as well as a network of Pace Bus routes. Joliet has a large, active housing market that offers a wide range of options. Whether you're looking for a spacious single-family home or a low-maintenance apartment, there's plenty to choose from within city limits. Housing prices in Joliet are also fairly affordable, with a median home price that's below state and national averages. Our lowest priced units in Joliet, IL average $50.50 per month. 88 people have reserved units in Joliet, IL in the past 30 days. There are 2 locations within Joliet, IL's city limits. There is 1 location in Joliet, IL that offers AC and Heating features.